East of the Hamptons sits a solar-powered, holiday home that celebrates indoor-outdoor living. 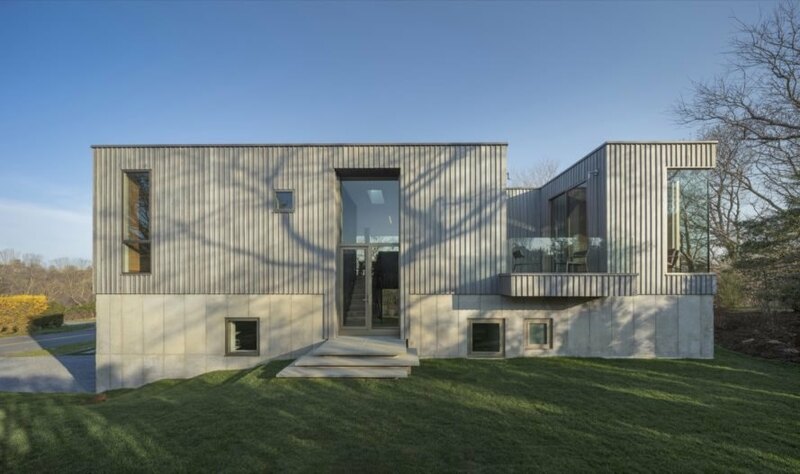 Wrapped in exposed concrete and fire-resistant charred timber, the home — dubbed the Montauk House — is the work of Desai Chia Architects, a New York City-based design practice that created the two-story home (with a basement level) for a family with two children. The roof of the house also conceals a large photovoltaic array that harnesses enough energy to power the entire residence, while passive design principles were applied to reduce the overall energy footprint. Located on the tip of Long Island, the two-story Montauk House spans 4,600 square feet on a corner lot edged in with mature landscaping for privacy and shade. The architects located the main living areas and master suite on the upper level, which includes the combined living room, dining area and kitchen, two studies for the parents, a powder room and a master bedroom suite. The two children’s bedrooms and an additional guest bedroom are located on the ground floor along with a shared bathroom and the one-car garage. 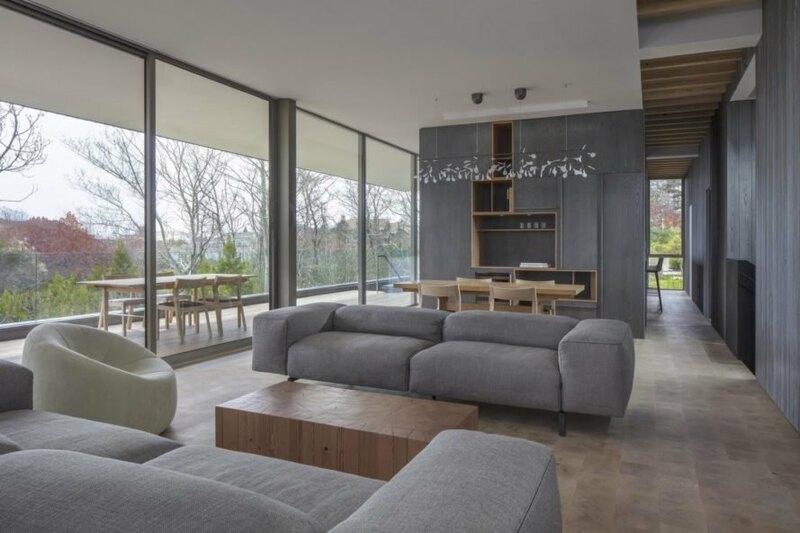 Walls of operable glass pull the outdoors in, while the open-plan layout facilitates clear sight lines across large sections of the dwelling. Indoor-outdoor living is emphasized with the addition of three outdoor terraces, each protected by deep overhangs to allow for relaxing and dining in the summertime. A ‘garden’ terrace links the ground-floor family room to the outdoors, and a ‘reading’ terrace spills out from the upstairs office spaces. 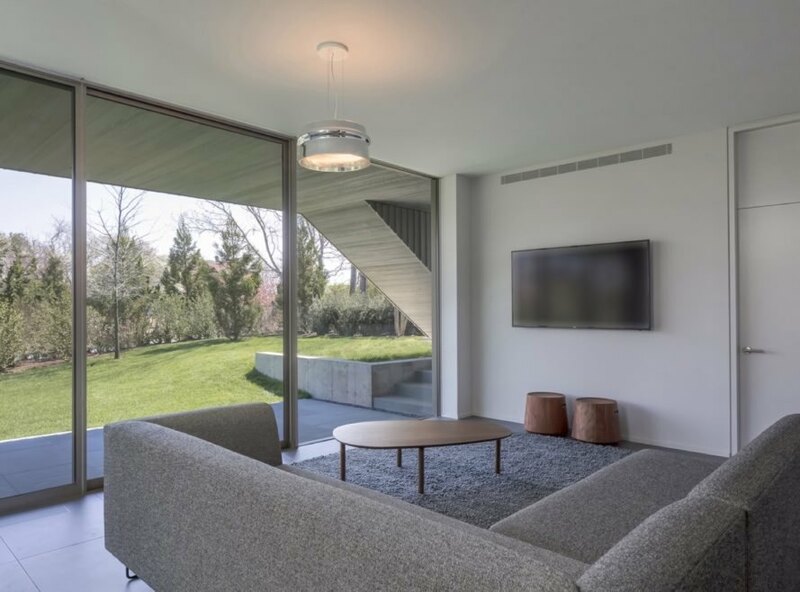 The ‘breezeway’ terrace — the largest of the three — is a south-facing space that runs the length of the home and connects to the open-plan living, dining and kitchen area. 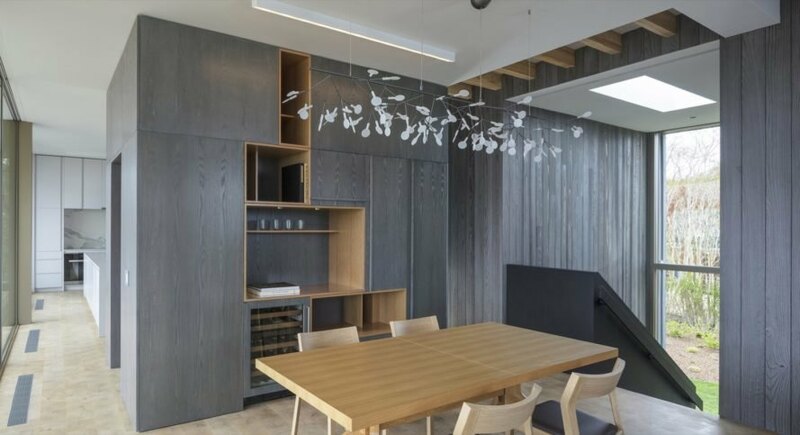 In addition to rooftop solar panels, the home embraces green design with the use of low-maintenance materials. The rainscreen of wood was treated with the traditional Japanese process of shou sugi ban to develop resistance against rot, pests and fire. 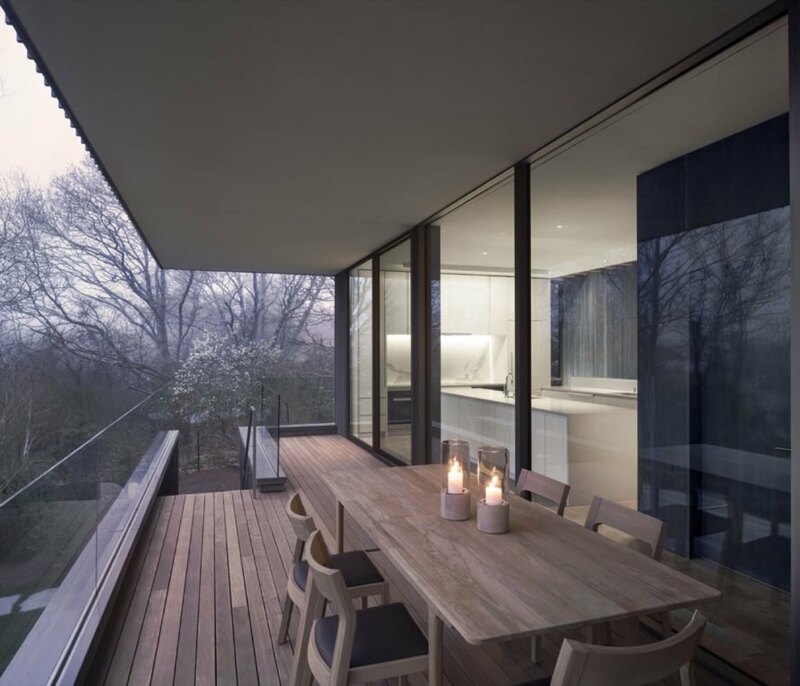 Ample glazing also illuminates the interior with natural light, while the cantilevered roof deflects unwanted solar heat gain. Natural ventilation has also been optimized. This sleek, modern home in Montauk produces its own energy. The home is wrapped in concrete and fire-resistant timber. Simple interiors keep the focus on the outdoors. An open-plan dining, living and kitchen space is ideal for entertaining. 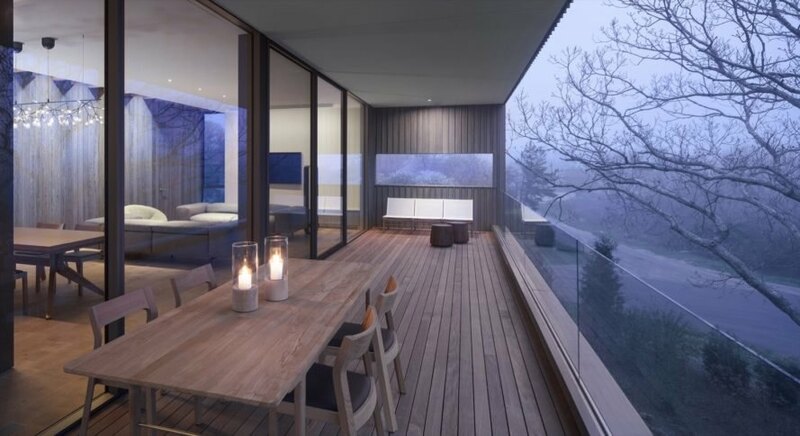 Full-height glass offers views of the serene landscape. Three outdoor decks connect the indoors and out. The decks include a 'garden' terrace, a 'reading' terrace and a 'breezeway' terrace.